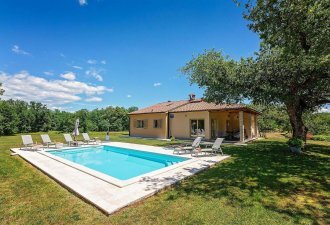 Villa Zaria is a beautifully renovated and refurnished holiday home in the small place Martina, on a small hill with wonderful panoramic sea view. In the village there are only few houses and a road leads up the hill to Moscenice, a hillside village with breath-taking views of the Kvarner, the sea and the nearby islands. The beach, a shop and restaurants are in Brsec, just 1,5 km from the holiday home. Villa Zaria was built in 1860 and completely renovated in 2018. On a 950 sqm big property, there is a swimming pool of 32 sqm, sunbathing area, covered terrace with summer kitchen, dining table for outdoor dining, lounge area and three parking spaces in front of the house. Villa Zaria of 150 sqm on three floors. On the ground floor there are two bedrooms with double bed and a large shower/toilet, on the first floor are the kitchen, the dining room with dining table for 6 persons, a separate living room with balcony with sea view and exit to the swimming pool and a separate toilet. On the second floor there are two bedrooms and a shower/toilet. These two rooms are not separated by a door.